Being ready for 'little devices' can bring you more sales. Mobility is popular. Technology builds for it, money spenders use it and you, online seller, should be ready for it. While only a quarter of e-commerce sales are completed through mobile devices, there is still a whopping $25 billion being generated by those little things. And that number will only go up in the coming years. The short answer to why your product listings should be more mobile friendly can be summed up in four words: access to mobile shoppers. 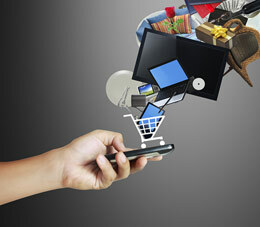 More people are turning to mobile devices for their shopping excursions because it's convenient. In addition to the many features mobile devices offer, users carry purchasing power in their purses and can buy something on a whim. As many as 52 percent of U.S. laptop users also own a smartphone, and 31 percent of all smartphone owners also have a tablet, says digital product leader Luke Wroplewski. Further, 13 percent of Americans own all three. And, as mentioned earlier, more than one-fourth of online sales are made on mobile devices. Sure, mobile users can still access your website as is, and make purchases with relative ease, but did you know that navigation can be difficult and loading time can take longer if a site is not "mobile friendly?" If your site isn't optimized for these devices, your chances of losing a sale increase. Perhaps you would be more encouraged to develop a friendlier user experience by analyzing your traffic and discovering exactly where your users come from. "A solid analysis will give you a good understanding of the status quo and will help you identify what areas to prioritize," experts at Google say. "Most successful businesses with multi-device websites analyze interactions across devices and continuously improve their Web presence." When you know what users are doing on your site and which devices they are doing it with, you can then arrange your content to better serve their purposes. There are a number of smartphones, tablets, laptops, desktops and browsers in the market. This ultimately means your site or product listing should function in a user-friendly manner across diverse screen sizes. For those who sell on platforms like Amazon, eBay and Etsy, you don't have to worry about developing a site for mobile users because these platforms have done all the work for you. What you do need to concern yourself with, however, is how your product listings appear on the different devices using those apps. For example, when a mobile user shops through the eBay app, the most prominent feature in search results is the gallery images, followed by the price tag and first several words of the title. When the listing is selected, your gallery image and price are still prominently featured, followed by basic seller, shipping and payment information, and then your product description. By this example we know that a good photograph, price tag and title should be your priority. I haven't yet been able to find a way to test how a listing appears on the mobile apps other than using the actual device itself, so if you or a friend has the different devices, I encourage you to utilize them so you know exactly how they function. Otherwise, there are tools you can use to get an idea how your non-mobile-specific site appears on different devices. For example, iPad Peek shows you how a website looks on iPad's different versions. Test it out by placing your product listing URL into the emulator. Reviewers at Six Revisions and WebDesignerDepot both list other good mobile emulators worth trying out. You'll notice that overall page design and navigation should fit comfortably on different screen sizes if you want to retain a mobile user's attention. If I've convinced you to work on making your site and listings more mobile friendly, then you're ready to make any changes you've determined are necessary. As we saw in the eBay example, good gallery images are most important. We live in a visual society, and it's more pronounced when it comes to mobile devices. A strong photograph entices users to learn more about what you're selling, and a clear title aids the selling process as well. For those operating sales from your own domain, you have a little more work to do. Experts at Google report three approaches to adjusting your site for multi-device users. Talk to your Web developer to determine which is best for your needs. The first is "responsive" Web design, which enables your site to automatically adjust and rearrange the content based on the screen size being used. This option allows you to use only one URL for all devices. A quick trick to see how this works is to open your browser to the WordPress site and use your mouse to make the screen narrow. As the browser becomes narrower, the content readjusts to fit the screen. Not all sites work like this, which is why I use WordPress as an example. Another approach which allows only one URL but requires maintenance for each device option is called a "dynamically serving" design. In this case, the webserver detects which device is accessing your URL and presents a customized page for that specific device. Any time you change your site's content, you have to make those changes for each customized page. The last option is to host different URLs for each device. When a mobile user goes to your original URL (e.g., nytimes.com), the browser detects his or her device and redirects them to another URL suited for that device (e.g., mobile.nytimes.com). This requires you to purchase and maintain each URL independently but allows for good mobile user experience. Just be sure to use the same domain to retain brand identity. Vendors like DudaMobile, Mobify and MoovWeb are some recommended vendors that will do all the legwork to make your website mobile friendly, if you like. how can I get multiple photos to appear in a mobile phone as Ebay will only show the gallery pic....auctiva pics are located in the description section which does not appear on a smart phone...?? How can I get multiple pics to show up on the eBay app on mobile devices? We an only get one picture to show and then you have to open the listing and go to item details and then item description in order to have more pictures. eBay recommends against using Flash or other templates in listings. Personally I like to use templates. What are your thoughts on this? Thanks. Great info! Is there anyway to check what individual listings look like on mobile devices? I would like to see what some listings look like because my ebay store looks fine but sales have been horrible.